NAC's new patented design, the L-893X(L) LED Temporary Runway Closure “X” Marker is a reliable, efficient, and environmentally friendly visual aid for airports. Continuous operation involves flashing directional LED lamps every 2.5 seconds and is powered by a combination of dual batteries and generator. A ground power cord allows for easy system charging or can be used in connecting a back-up generator, if needed. The L-893X(L) will operate for 3-4 days (time may vary with altitude and outside temperatures) using only 20 gallons of fuel. Run-times can be extended by adding solar panels(sold separately). How do you comply with the FAA policy for marking a RWY Temporarily "CLOSED"? NAC's patented folding pneumatic deisgn allows fast and easy setup in five minutes! 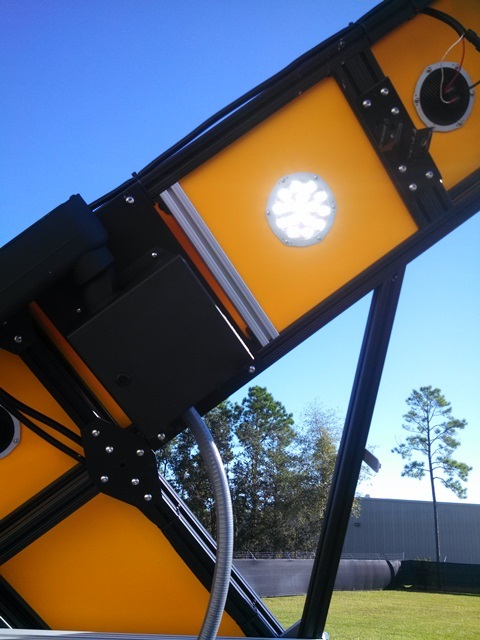 Designed using solid aluminum X frame with black boarder, yellow composite plastic, with nine(9) white circular 30 degree LED Lights (38 watt, 24 v Sunspot®36 LED light fixtures driven by a 120 vac drivers). Each LED fixture is designed with 16 high power individual LED's includes in a water tight-shock resistant casing . Back mounted LED for visual monitoring from the non-display side and synchronized to flash or steady light settings. 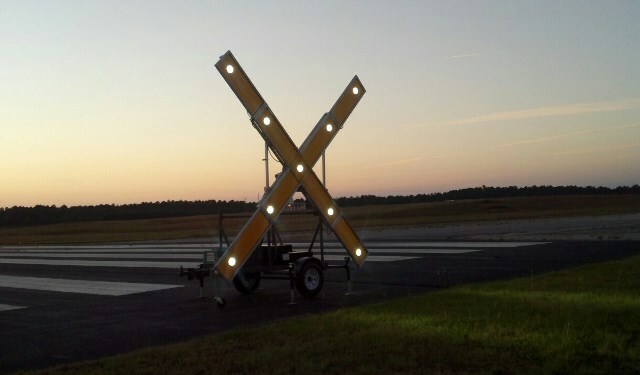 The X display is adjustable up to 3 degrees for matching runway flight approach paths. The X frame is constructed of 1.5"x1.5" aluminum alloy composite with black anodized coating(Black border). Flash intervals are controlled for auto controlled and night mode that the RCM signal, bright or dim, will flash at a rate of 2.5 seconds “on” (+/-20%) and 2.5 seconds “off” (+/-20%)using a solid state electronic controller. Cummins Onan EVAP Generator rated 4000 watts. Designed to run only when needed to charge onboard battery pack. All switch functions operate from battery powered system with generator support. Low oil pressure automatic shut down control & Electric start. Anti-vibration generator and control box mounts. System operations bypass for “plugged” into a NEMA L5-30 receptacle without the using generator. All electronic components UL listed. DOT approved brake, tail lights, turn signals and side reflectors. Rear mount tow harness and hitch for tandem towing. Four point 5,000 lb. jacks with 13 in, extension and front hitch 1,200 lb. trailer jockey wheel. 175/80/13 tubeless tires, 13 inch wheels and fenders. Trailer constructed of 1.5 in. x 3 in. rectangular tubing. Minimum purchase quantity is two (2), for quantities greater than four (4) please contact our customer service team. 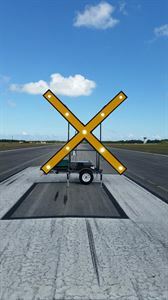 NAC's new patented design, the L-893X(L)(D) LED Temporary Runway Closure “X” Marker® is a reliable, efficient, and environmentally friendly visual aid for airports. Continuous operation involves flashing directional LED lamps every 2.5 seconds and is powered by a combination of dual batteries and generator. A ground power cord allows for easy system charging or can be used in connecting a back-up generator, if needed. 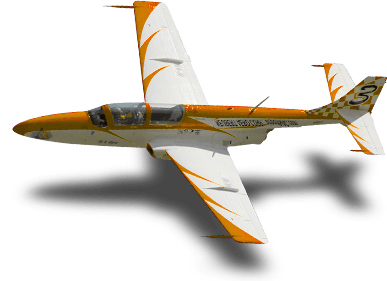 The L-893X(L) will operate for 3-4 days (time may vary with altitude and outside temperatures) using only 20 gallons of fuel. Run-times can be extended by adding solar panels(sold separately).